Let me start with a little background. Four and a half years ago I found myself at one of those pivotal points in life where decisions and complete changes in direction had to be made. It was a very frightening time for me. I had been a stay at home mom for 25 years. I was faced with all sorts of doubts about my ability to support myself and didn’t even know where I was going to live. I had some education to fall back on but no degree or current work experience. The one thing I did have going for me was my love of fiber arts! But I wasn’t sure how I could make a living with my skills & knowledge. I had done it all, from raising animals to finished garments, I had joined guilds, learned to judge and teach, dye, demonstrate, and write patterns among many other things. During this decision-making time, I happened to see a Twitter tweet from Laura Zander, co-owner of Jimmy Beans Wool. She was interviewing to hire people! I took the chance and sent in my resume. She responded and we set up an interview. I was subsequently hired! Despite my lack of work experience, she took a chance on me for which I am deeply grateful everyday! 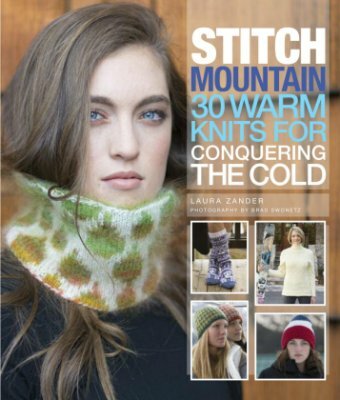 Last year I had another opportunity, to be included as a designer in Laura’s new book Stitch Mountain 30 Warm Knits for Conquering the Cold. I’m just beginning to get my feet wet as a designer, so this is a huge and very exciting thing for me! I wouldn’t quite let myself believe it was happening. Not until I saw the actual book! It’s still a bit surreal! My design in Stitch Mountain is the Snowflake Hat inspired by local, snowboarding pioneer Jeremy Jones. To tell the truth I don’t know much about snowboarding but I do love the outdoors, hiking, cross-country skiing and snowshoeing in the back country so I think I understand part of what drives Jeremy. I’ve watched some the movies in which he was filmed boarding down rugged peaks and I was in total awe! He floated down slopes so steep I marveled that he could even stay in contact with the snow! His boarding is a thing of beauty beyond description! Amazing!!! If you get the chance, watch his movies! Jeremy asked for a traditional Moriarty style hat, a style popular with skiers and handmade by the Moriarty family in Stowe, Vermont for decades. He also asked for the logo of the non-profit organization he founded, called Protect Our Winters (POW) to be part of the hat. I wished to convey something of the complexity, skill and breath-taking ease that Jeremy exhibits on the snow, so I took the simple design and added some unique twists on techniques. It’s not an easy hat to start. Much like the self-powered ascents Jeremy now makes to snowboard back country peaks. Difficult to get there but oh so worth the ride! This double thick hat is made with Rowan Pure Wool 4-ply in colors green and white and begins with a double-sided cast on, much as you would use for toe-up socks. This makes for a seamless fold at the bottom edge. The first row is knit flat, working one stitch from each tip alternately, double knit style, until all of the stitches are on one circular needle. At this point the hat is joined in the round and worked completely in double knit. The Snowflake Hat is perfect teamed with the wonderfully talented Rachel Roden’s Twisted-Stitch Mitts in the same yarn and colors, as the skilled Stitch Mountain photographer Brad Swonetz quickly realized during the photo shoot! I hope you enjoy the entire book which is chock full of warm and cozy knits! There isn’t a pattern in this book that I don’t love! In fact today, on the Stitch & Unwind blog by AllFreeKnitting.com, you have a chance to win a yarn bouquet containing all the yarn you need to make a Snowflake Hat, as well as your own copy of Stitch Mountain. Check out this giveaway as well as many others from the book for the rest of this month! This entry was posted in Press releases and tagged allfreeknitting, double knit, jeremy jones, laura zander, pure wool 4 ply, rachel roden, rowan, snowflake hat, Stitch Mountain, unraveled designs. Bookmark the permalink.